The Intellivision and Atari 2600 clashed in the first ever video game console rivalry, beginning in 1979 and lasting well into 80's. Boasting high-resolution graphics (and later an impressive voice synthesizer), the Intellivision was superior to the 2600 in several ways. The system excelled in sports games as demonstrated by George Plimpton in a series of famous commercials comparing both console's titles side by side. 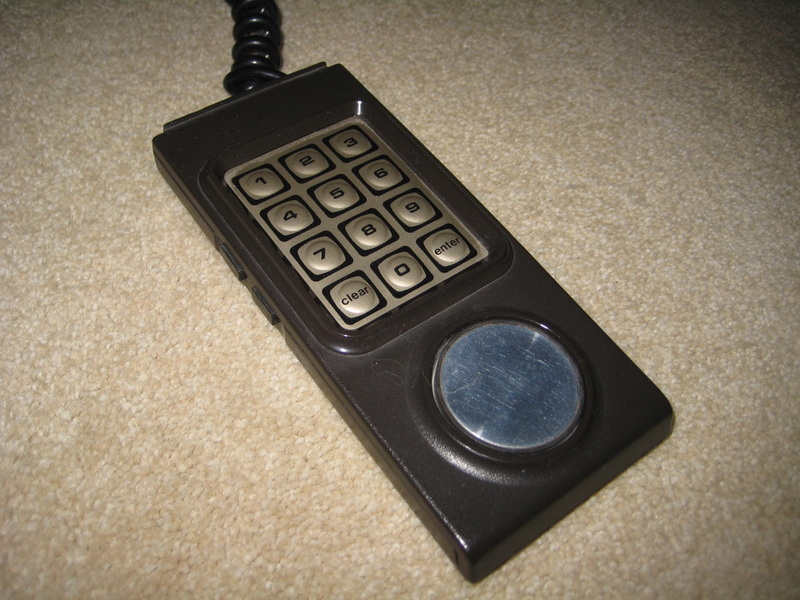 The Intellivision's sophisticated controllers, which boasted numeric keypads, allowed for far more complex gameplay. But although the Intellivision did offer some impressive titles, the lack of high profile arcade hits was a major problem. Mattel abandoned the system shortly after the video game crash of 1983, but a small company by the name of INTV carried the torch for the system for the rest of the decade. Console design: C-. 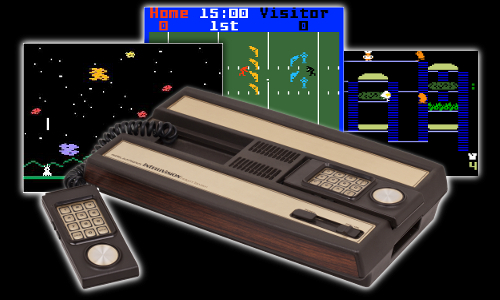 The Intellivision system existed in three forms, but only the first two were sold in large quantity. The first version features a streamlined design, with two bays to slide the controllers into, a power switch, and a reset button. Gold and brown in color, it also features the obligatory fake wood trim (popular in the 70's for some unknown reason). The cartridge slot is located under the right side, and inserting a game requires lifting the console up and pushing fairly hard. The controllers are connected via very short coiled wires that force you to sit right next to the console while playing. The second incarnation of the system resembles a small white box, with a single button serving both the power and reset functions (hold down to power off). Although this version has detachable controllers, for some reason they are noticeably less comfortable to use. For this reason, the original version is generally the most desireable. Console durability: C. Intellivision consoles tend to hold up fairly well over time, with the exception of the reset switch, which is easily broken. Controllers: F. The Intellivision controllers are the worst aspect of the system. Instead of a joystick, a 16-direction round pad is situated on the bottom of the controller, and it's hard on your thumb during extended play. Each side of the controller has two buttons that are tight and hard to press. The keypad on the front of the controller allows for sophisticated gameplay, but it's hard to locate a specific button without looking down at the controller. In general, Intellivision controllers are extremely uncomfortable and poorly suited to long play sessions. Media: C-. 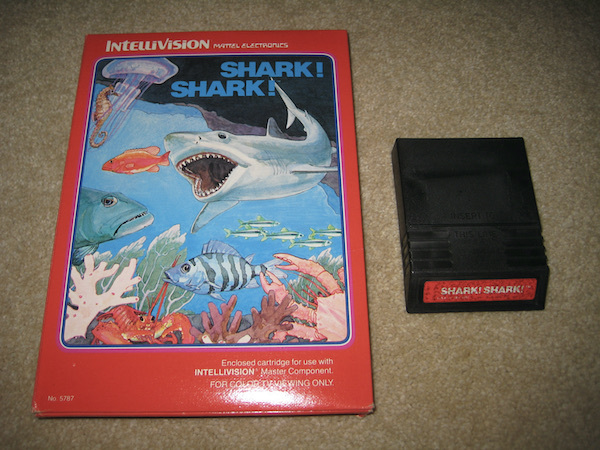 Intellivision cartridges were smaller than Atari 2600 games, and only had an end label. Most games did not feature any sort of artwork on the cartridge itself. Packaging: B. Intellivision games were sold in boxes slightly larger than the Atari 2600 game boxes. The boxes were printed in several colors, and there was actually a scheme behind these colors (sport games blue, strategy games green, arcade games red, etc). Early games were shipping in boxes that opened like books, but later titles came in a simpler, 2600-like boxes instead. Games: C+. 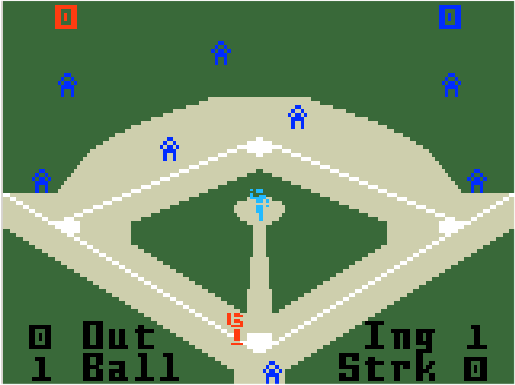 The Intellivision excels in two-player head-to-head games, particularly sports, combat, and strategy titles. This is reinforced by its large number of two-player-ONLY games. In order to address its lack of arcade-style games, Mattel released the Asteroids-inspired Astrosmash and the Star Wars-inspired Star Strike, both of which were very popular among the Intellivision faithful. Graphics: B+. While the Intellivision was capable of better graphics than the Atari 2600, its games ran noticeably slower and the animation tended to be less smooth. Initially, Intellivision games looked far better than their Atari 2600 counterparts, but this gap closed significantly as the 80's progressed. Audio: C. By itself, the Intellivision's sound capabilities are modest, with most games only emitting a series of beeps. 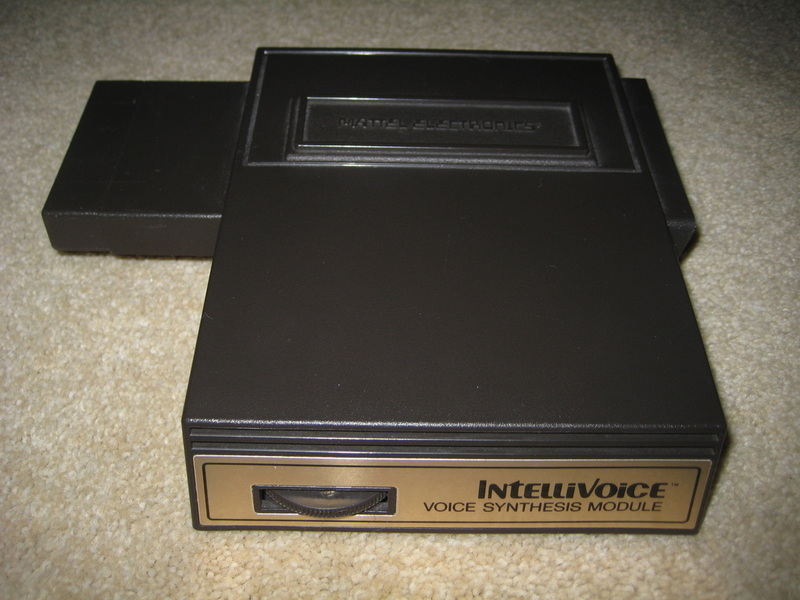 However, the Intellivision voice synthesizer gave the system's audio capabilities a major boost. Perhaps the system's most impressive technical accomplishment, this pluggable module could generate a wide variety of voices and inflections. Although only supported by a handful of games, it does play an integral part in these games, most notably the excellent B-17 Bomber. Collectability: C-. For collectors, the Intellivision mainly appeals to those who enjoyed it in its heyday. The early games are easy to find and inexpensive, but some of the best titles, released late in the system's lifetime by INTV, can run into some money. In addition, the fact that so many Intellivision games require two-players is a turn-off to some solo gamers. Still, for classic head-to-head sports and strategy action, it's hard to beat the Intellivision. Innovations: Keypads, keypad overlays, disc-shaped control pad, voice synthesis.